Winter is not exactly my most favorite season, I know the snow is magical and it is the best time of the year …. warm soups, hot chocolate, holiday cheer… but I can feel the icy sub zero wind chills in my bones. Let’s not even start talking about the pale blue light on cloudy days, I yearn warm sunshine. The only meal that really comforts me is a warm soup, I heart soups and you certainly cannot enjoy them as much in summer. Most of the soups I make is a one pot meal, with some cheese and bread and you got a hearty meal on the table. 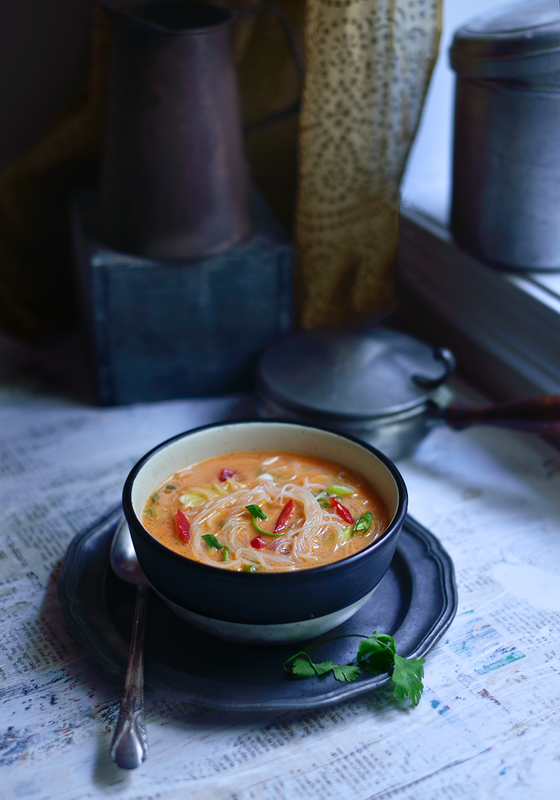 Thai curry soup is my all time favorite, it is so filling and full of flavor, the best part of this soup is you don’t need a lot of ingredients in your pantry. Just a bit of creativity and some imagination. I almost forgot to share some exciting news. One of my images won a photography contest at Craftsy:here is the link to the image . The second one is huge for me, Michael Ray’s made a list of 100 best food photographers in the world….and I have no idea how, but I did make that list. Michael needs no introduction, he is one of the top food photographer with some hugs brand names under his wing, his work is outstanding . The link has some amazing people on the list, very inspirational and certainly very humbling. Here is a link to the list. 2-4 tbsp of red curry paste (store bought) or you can use recipe of a Thai curry blend. • 2 tablespoons whole cumin seeds, toasted • 2 tablespoons whole cardamom seeds, toasted • 2 tablespoons whole coriander seeds, toasted • 1/4 cup ground turmeric • 1 tablespoon dry mustard • 1 teaspoon cayenne Grind all the above to a fine powder and store in a cool dry place, is good for unto 12 weeks. Sauté the veggies in vegetable oil, pour a can of coconut milk, add /2 cup of veggie or chicken stock, now add the curry paste or 2-3 tsp of Thai spice blend. Some brands of thai curry paste are very spicy while others are bland, so use your discretion. Add the cooked noodles and bring to boil, garnish with thai basil or cilantro and sesame oil. Make sure the veggies are not cooked all the way and are al dente. Serve hot. 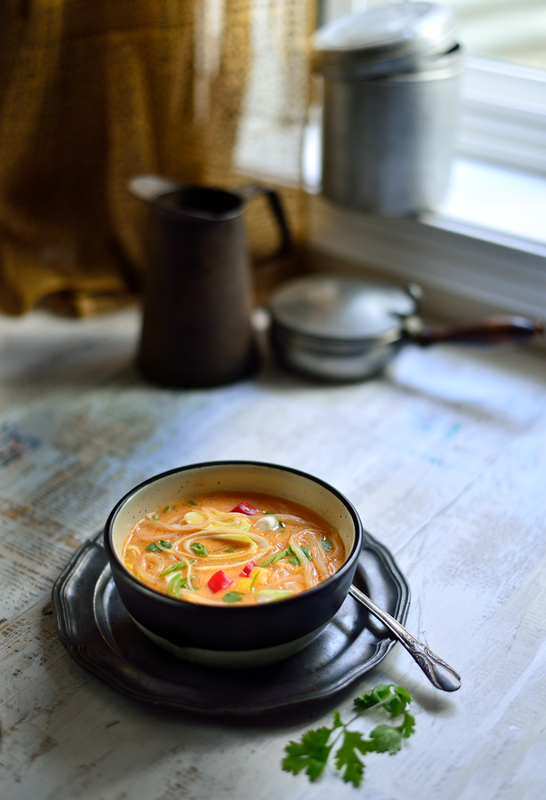 Curry Noodle Soup sounds like the perfect dish to eat in this stormy, extremely cold winter weather. 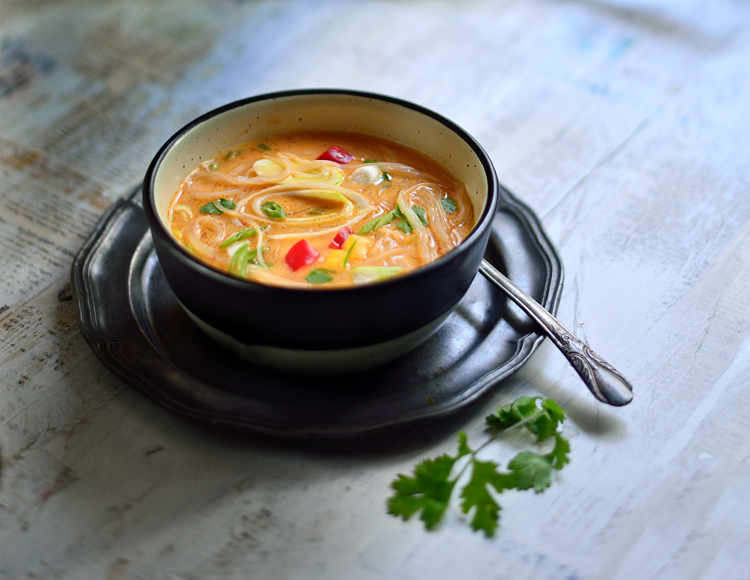 The noodle soup looks really comforting and tasty! Looks awesome. 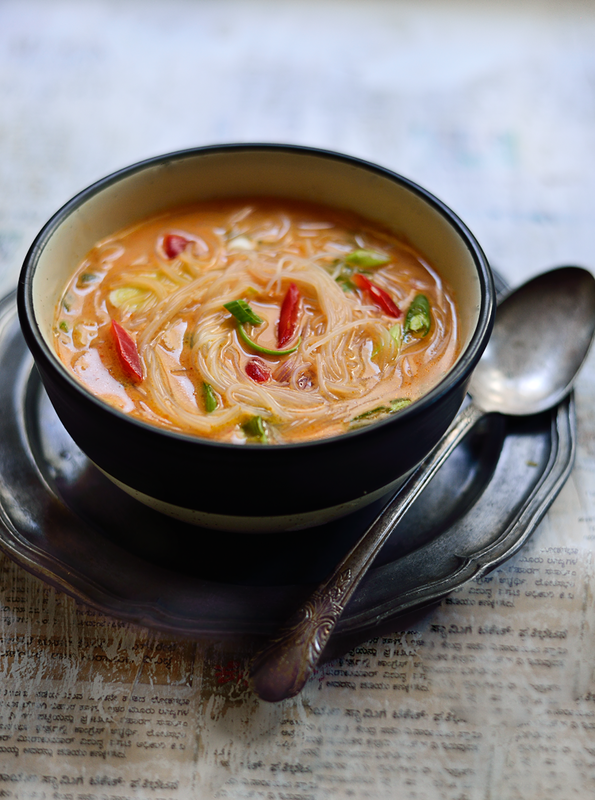 A nice big bowl of this sumptuous soup would make a satisfying meal ! A delightful soup! So comforting and wonderfully spicy. I love that first shot. So moody. Congratulations! You are very talented. looks so tempting... i want to have now. Congratulations on the two wins! You've completely earned the honour - your food photography truly is stunning, and one of my favourites to come back to each time. And this soup!! I have to say I am enjoying NOT seeing another Christmas cookie on the blogosphere right now. Great work! Oh this sounds delicious! Congratulations on your accomplishments! Your photos truly are beautiful. I am very happy for you Simi. Congratulations. This looks like the perfect winter soup! yum! congrats on the contest your photo is gorgeous! I can't believe that I came across your post on this delicious soup on yet another cold and dreary day, after almost a year of you writing it probably on another Cold and Lazy day :-D. Haha... This is beautiful stuff :-D. Keep Creating. Stay blessed :-D.
And Congratulations on your success :).